Yes! Summit offers CE Broker reporting on behalf of FL PTs, OTs, SLPs, ATCs and LMTs as well as for AL PTs, OH SLPs, SC PTs, OTs and SLPs. Licensees for states/professions outside of these listed should self-report at www.cebroker.com using the information provided on the certificate of completion. Completed in the state of FL for by FL Licensees or by AL PTs, OH SLPs, SC PTs, OTs and SLPs: Summit will collect license #’s on the sign-in sheet and will report automatically once your attendance has been verified, in up to 28 days from the day the course takes place. Completed outside the state of FL by FL Licensees or by AL PTs, OH SLPs, SC PTs, OTs and SLPs: Please email your request for CE Broker reporting to ceinfo@summit-education.com after you have completed the course. Include in the email request: “Report to CE Broker” in the subject line, Name, Summit order #, Date of course completed, State, Profession and License number. Completions will be reported as soon as attendance has been verified via the Sign-in sheet (up to 28 days from the course) and an email confirmation will be sent in reply to the request. Please note if your state/profession is outside of those listed above you will have to self-report at www.cebroker.com using the information provided on your certificate of completion. Completed by licensees who reside in FL, AL, OH and SC: The option to request CE Broker reporting will be available via a “Report to CE Broker” button in your Summit account beneath the course title. The button is available for 30 days from the date you pass the post-test. If the request for CE Broker reporting has not been submitted by the 30 day deadline, the button will disappear and you will have to self-report at www.cebroker.com using the information provided on their certificate of completion. Online completion requests for CE Broker reporting will be reported in up to 10 business days from the date the request was received. 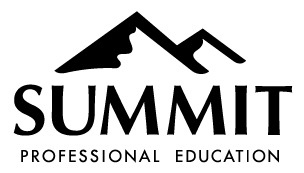 Completed by licensees who reside outside the state they are licensed in that are FL Licensees, AL PTs, OH SLPs, SC PTs, OTs and SLPs: Please email your request for CE Broker reporting to ceinfo@summit-education.com after you have completed the course. Include in the email request: “Report to CE Broker” in the subject line, Name, Summit order #, Date of course completed, State, Profession and License number. Online course completions will be reported in up to 10 business days from the date the request was received. You will be emailed a confirmation as soon as the completion has been reported. Please note if a licensee’s state/profession is outside of those listed above they will have to self-report at www.cebroker.com using the information provided on their certificate of completion.